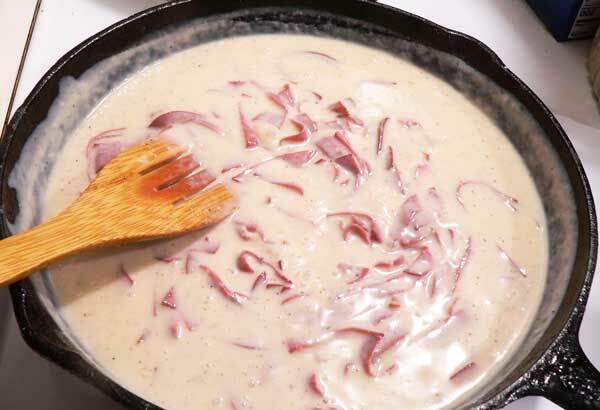 Follow our easy, step-by-step, photo illustrated recipe to learn how to make SOS, our Creamed Chipped Beef recipe. Printable recipe included. 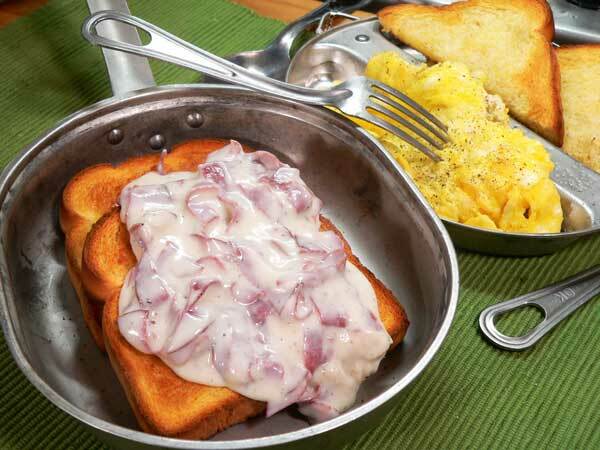 We’re saluting our Veterans with a flash back to the past with SOS – Creamed Chipped Beef. This was one of the early dishes that I prepared as a youngster. I’d already mastered macaroni and cheese in the blue box so it was time to up my game as they say. Smile. Having heard my brother talk about something like this from his days in the US Army, I decided I needed to see what all the fuss was about. The military folks call it S.O.S. which some folks say stands for Same Old Stuff. Most know it by another name that I’m not going to mention here, but It’s something like S–t on a Shingle. I think it’s because they got served the dish pretty often. Supposedly it was quick and easy to make for a large group of military folks either in the Mess Hall or while out in the field. It was also made sometimes with ground beef or sausage. In my early attempts I made a version using a canned gravy and one of those packages of Buddig Beef that you could buy for hardly anything in the grocery store. You know those little packages of processed meats that sell for about a dollar a packet and hang in the processed meat counter? I couldn’t order any of that online, so I’m using the much more preferred dried beef from a jar to make this version. Normally this would be served for breakfast over toast or biscuits, but it will make a quick and easy meal for any time of the day. I’ve been wanting to do this for a couple of years just to bring back some memories for our Veterans of the military, but it took awhile to finally get it completed. So, with thanks to all the great men and women that have served and still serve our country, let’s scoop up some Creamed Chipped Beef on toast. Ready to give it a try? Alright then, let’s head on out to the kitchen, and… Let’s Get Cooking! 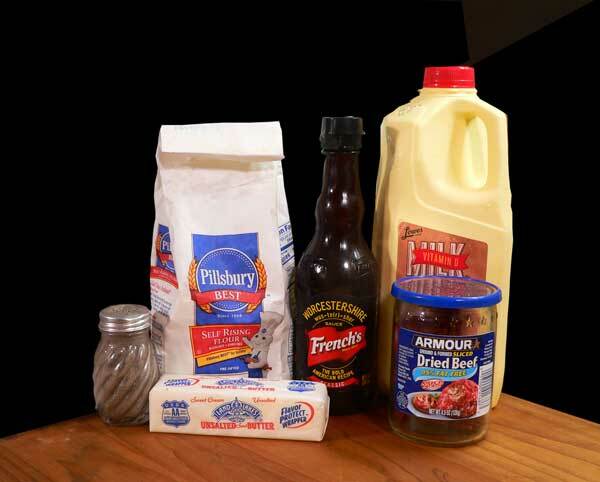 Creamed Chipped Beef Recipe – You’ll need these ingredients. Rise and shine and lets begin. 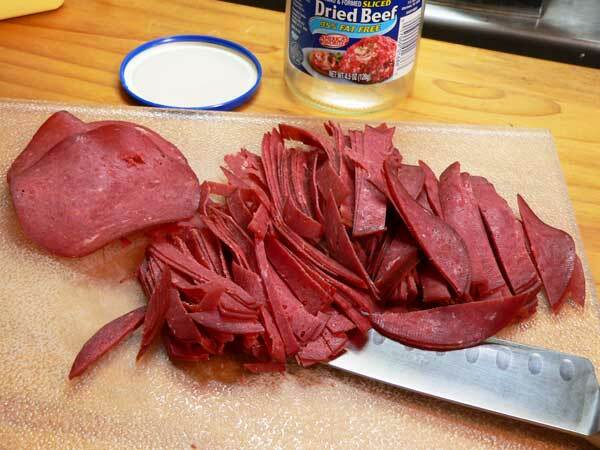 Place several of the slices of dried beef on top of each other, then slice those into thin strips. Place the strips in a small mixing bowl and cover them with warm water. Dried Beef is very salty. Even the lid on this jar suggests that you rinse the beef in warm water first to remove some of the saltiness. I allowed these pieces to soak for about 30 minutes, then drained the water off. Discard the water, it’s too salty to use for anything else. Set the beef strips aside for now. 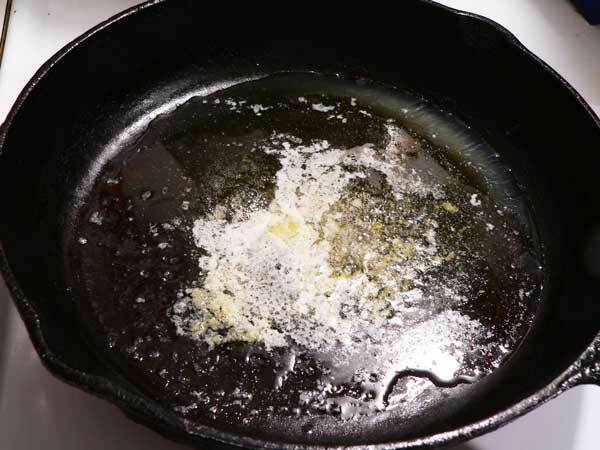 Place your skillet on your stove top and set the heat to about one notch below Medium. Add the butter, and let it melt. 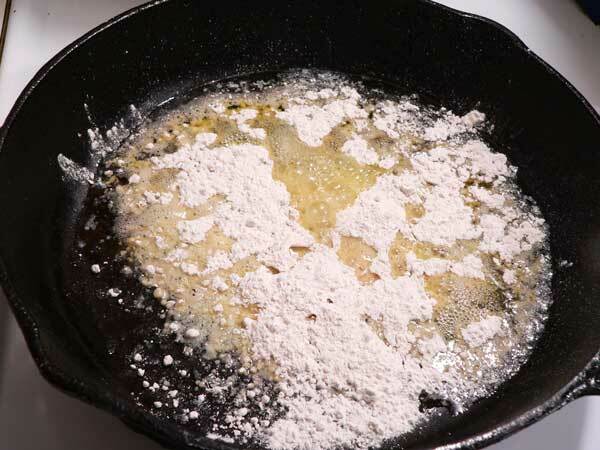 When the butter is melted, sprinkle the flour over the top and start stirring. Quickly stir the flour and the butter together. I like to use this flat ended wooden spatula to stir my gravies with. I can scrape the bottom of my pan and not worry about scratching it. You’ll need to stir this quickly to avoid lumps. 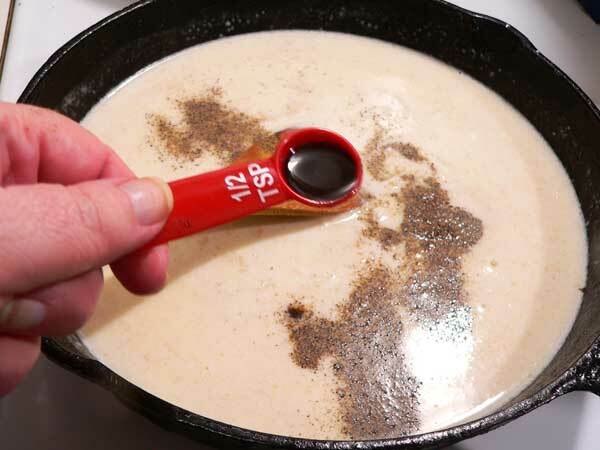 If you see any, just continue to quickly stir the mixture and most of them will dissolve away. Let this cook for about a minute, maybe two, to slightly brown the flour and cook away that flour taste. 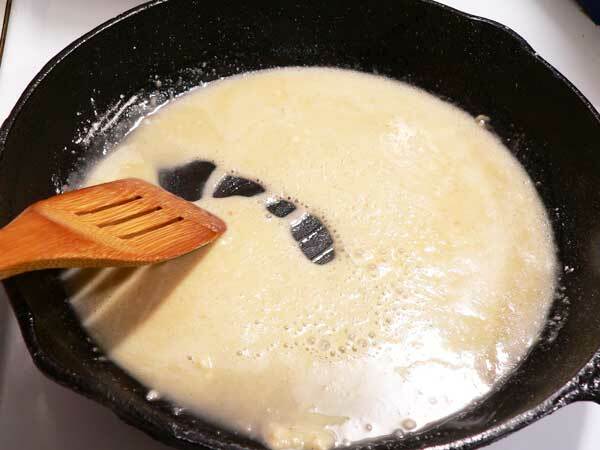 Gradually start adding the milk, stirring quickly until you’ve added the full three cups of milk to the pan. Don’t add cold milk, it should be at about room temperature for best results. Continue to stir quickly, scraping the bottom of the pan so it doesn’t stick or burn. Do this until the milk begins to simmer. And if so desired, add the Worcestershire Sauce. It’s optional, but it adds a bit more flavor to the finished sauce. Constantly stir the sauce until it begins to thicken. The hotter it gets, the quicker it will thicken and you don’t want it to start clumping up on you. 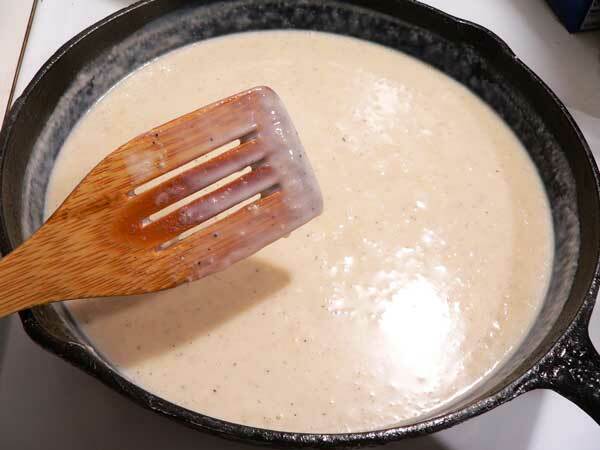 If you see any lumps, try to break them up with your spatula and quickly stir them into the mixture. Add the strips of dried beef to the sauce. Some of the military recipes used ground beef instead of the dried beef. I’m sure it would taste a bit different, so experiment with the recipe to see which you like the best. Now’s the time to taste it to see if it needs anything else. I actually added just a bit of salt to mine to enhance the flavor more. I was surprised it needed it, but guess I rinsed it all off in the beginning. Smile. Continue to stir the mixture and let it simmer for about two minutes. That’s all the time it needs, just enough for the meat to get hot. Serve the beef over toast or biscuits. It’s generally served at breakfast, so some eggs would go pretty good with it. I toasted my bread in the oven, and even slipped a few pats of butter on one of the slices. Toast doesn’t get any better than when you butter it and toast it in the oven. My favorite way of enjoying it. Now you can get an idea of where the “on a shingle” part came in with serving it over toast. It’s a quick and easy dish for breakfast or anytime of day. I’d love to hear your comments on it below. Creamed Chipped Beef is also sometimes known as SOS by our military folks. It’s a quick and easy addition to breakfast or any time of the day. 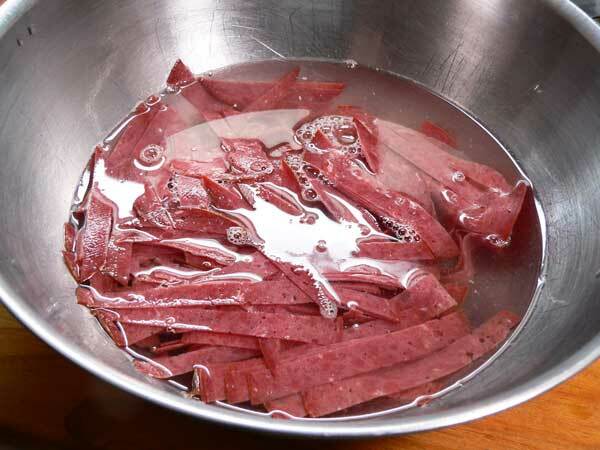 Cut the dried beef into thin strips. Place strips in a small bowl and cover with warm water. Soak the strips for 30 minutes, drain, discard the water. Add the flour, stirring it in quickly until combined with butter. 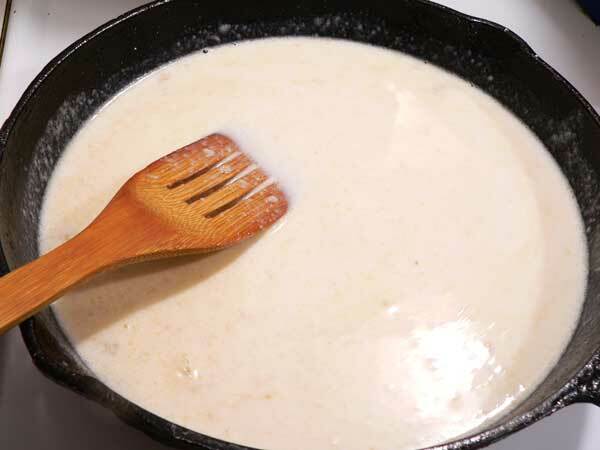 Add the milk, stirring quickly until fully combined and it starts to thicken. Add the Worcestershire sauce if desired. Add the strips of dried beef, stir until fully coated. 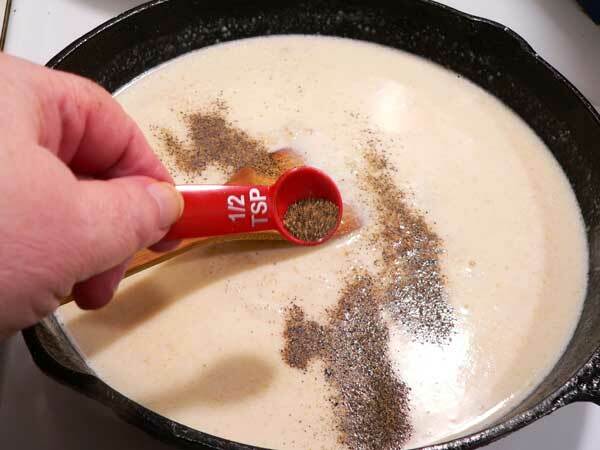 Spoon over toast or biscuits. 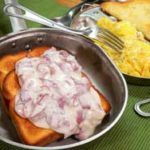 Have you ever tried Creamed Chipped Beef? What did you think about it? Share your memories of this dish with us. It will only take a minute or two for you to leave your comments in the section below. Back in the ’40s we had it on rice for dinner and the left-over on toast for breakfast. Great food. I made this for my husband this morning and he loved it!! I did do one thing a little different, I did soak the chipped beef to remove some of the salt but is seemed to take some of the flavor out, so instead of adding any salt I added some chipped beef (not soaked in water) directly to the pan and it added more flavor and just the right amount of salt. I do love getting your newsletter each Monday and trying your recipes, they are so good and just like my Mom cooked. Hi Steve. The only dried beef I know is what we call biltong in South Africa, I think you call it jerky, but it is dark brown not red, so now I wonder if it’s the same thing? We get it as steak, strips or powder (powder used in cooking). Would it be roughly the same as you have used in the recipe? Thanks for all your efforts coming up with recipes that actually work when we cook them. Growing up Creamed Chip Beef was a regular for dinner. I think my Dad must have really liked it and he didn’t do breakfast. Now rather than make it myself, I found that Stouffers makes pretty good version in one of those handy little plastic bags. If you haven’t tried it, you should. I’m at the age where if it’s easier I do it. Hope your Vertigo is getting better. Wish my neuropathy would. I have made, or at least, eaten every posted recipe during my 75 years. Some I had forgotten about, like stewed potatoes. Love me some creamed chipped beef. Also make with ground beef. Sorry this is so long. I talk a lot all the time! Have a blessed week. See you next Monday. My mother made this for supper in the evening and she would add cut up boiled potatoes to the chipped beef and gravy over buttered toast. Very good and very filling. I may make this soon! I didn’t know they still made the chipped beef in a bottle! This was in one of my mom’s rotations too. She also learned how to stretch that hamburger. Vegetable soup with hamburger crumbled into it became Hobo stew, meatballs with rice mixed in and put in the pressure cooker with tomatoe soup were porcupine balls. 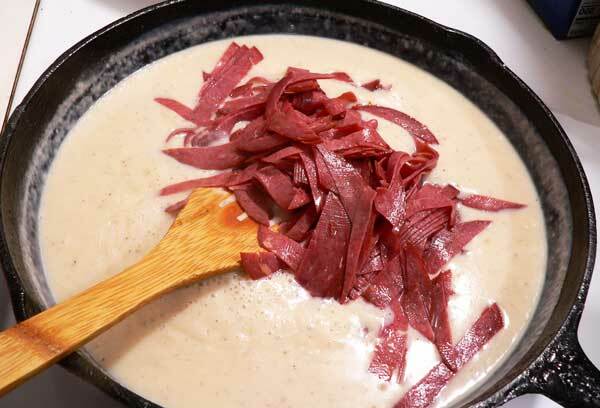 After I got married I tried to make creamed chipped beef and hubby didn’t like it. So I adapted it to a double boiler and when our girls were growing up I doubled the recipe and tore up toast into pieces for them. Hubby and youngest daughter scattered peas on top of theirs. Now that it’s hubby and I, I went back to original quantity and soft bread for him because of his dentures. Thanks for reminding me of how well my mom cooked with such a small budget. I love creamed chipped beef on toast for lunch or dinner. My mother made it using the Buddig beef and I do as well. I made it for my children when they were growing up and now make for my granddaughters. A great comfort food now spanning four generations of my family. We had chipped beef and gravy quite a bit at our house bacause everyone loved it. We had it for “supper” but not breakfast. Thank you for stirring up pleasant memories , I enjoy your emails so much. Being raised in Greensboro, I feel like I’m stepping back in time when I see some of your recipes. Keep them coming and prayers for you and your 2 friends with the health problems. Being born and raised in the Hicory NC area, I remember my mother making this. It was so good. She would have it in her rotation of meals. This was a favorite as was grilled cheese and a bowl of vegetable soup. Of course, she knew how to make a pound of ground beef magically stretch!! Blessings! How funny that you shared Creamed Chip Beef recipe this week. When I went to the grocery store last Thursday, I searched until I found the jar of dried beef on the highest shelf. I told my husband I had decided to make the creamed chopped beef for supper that night. Sure was good and satisfying.